Salva and Nya thirst for more than water as their parallel stories unfold in Linda Sue Park’s A Long Walk To Water. Their stories are far apart in time, Salva’s story starts in 1985 and Nya’s in 2008 both in the country of Sudan. The struggles they faced then are still active problems today, which makes this story even more relevant to readers. Salva spent most of his childhood without his family to point him in the right direction. From the time he was a child until he was a young adult, he spent many hours in a day for months at a time walking away in fear from the war that was ravaging his home country. His childhood was filled with fear, loss, hunger, thirst and little hope. However, he used his leadership skills to guide his fellow refugees away from another uprising. Linda Sue Park also shares the story of a young girl named Nya who spent eight hours each day for seven months each year going to retrieve water for her family until they receive a remarkable gift. 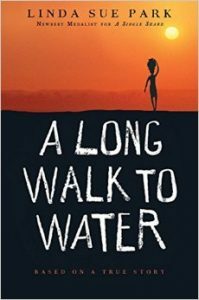 A Long Walk to Water may be a short story, but it captures the reader’s attention all the way through. Linda Sue Park has explored the themes of community, family, and the importance of hope. Salva used his uncle’s strategy to sustain hope in every situation, “Do you see that group of bushes?” Uncle said, pointing. “You need only to walk as far as those bushes. Can you do that, Salva Mawien Dut Ariik?” (p. 53) Salva acquired the skills of setting small goals to keep his dreams alive through all the struggles that he had to faces trying to escape the war. Linda Sue Park keeps her audience engaged, wondering what will happen once they flip the page. The author is very vivid in her descriptions, making it easy for the reader to visualize the scenes. I found it very easy to relate the story to what is going on in today’s world. Readers that like stories based on true events and real world struggles like what is going on in some parts of Africa not having enough drinking water would find it hard to put this book down. The life history of Salva and Nya reminds me of how much I take for granted.